Our letter openers come in popular designs like the Excalibur, Musketeers Rapier, Masonic letter openers, Knights Templar, Japanese letter openers, El Cid, Viking Styles and much more. 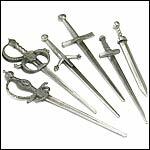 We have a large selection of miniature Medieval style letter openers. These letter openers make great office desk accessories. We also offer stands for your miniature openers and sell them in sets as well. Our letter openers are great for matching any historically themed decor. They also make great gifts for weddings, themed parties or as stocking stuffers at Christmas. Slay your wretched envelopes and avoid foul paper cuts with our beautiful high quality replica letter openers made by Armaduras. These Medieval letter openers are fine miniatures of the larger swords produced by Art Gladius. The blades are made of stainless steel and are as detailed as their larger counterparts. Medieval letter openers from the name you trust for replicas and miniatures of historical arms, Denix. Opening your various letters can be a tedious ordeal, but that is no reason to not show your warrior's spirit. Our range of letter openers show the development of swords through the ages. Each comes in its own display box with historical notes. Each is made from English pewter. Letter Opener Display Stands - Stands to Display your Medieval Letter Openers. High quality medieval letter openers and historic letter openers from Toledo Spain.